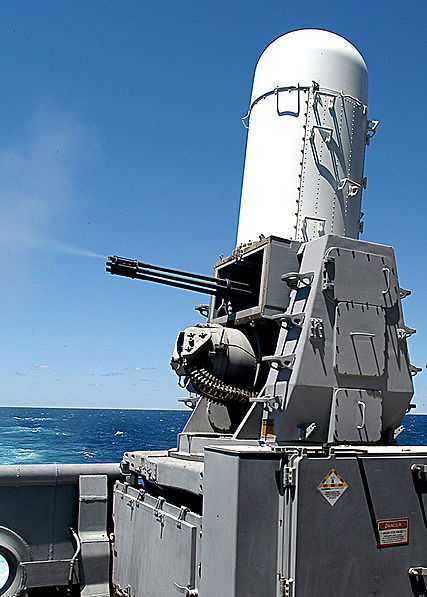 Phalanx is a Close-In Weapons System (CIWS) designed as a last chance, point defense, automated gun system designed to destroy in-bound anti-ship cruise missiles. Phalanx is a design from General Dynamics Corporation, Pomona Division. Its current manufacturer is the Raytheon Company. Phalanx is found aboard every class of U.S. Navy ship, Coast Guard cutters of the Hamilton, Legend, and National Security classes and in the navies of 23 allied nations. Phalanx has been nicknamed "R2D2" by people in the U.S. Navy after the famous android from the movie "Star Wars." Royal Navy sailors call them "Daleks" after the aliens in the long-running "Doctor Who" television series. In recent years, the U.S. Army has been testing a land version of Phalanx called "C-RAM" for Counter-Rocket, Artillery, and Mortar system. The C-RAM is a Phalanx module with an on-board generator and control station mounted on a low flatbed trailer. On 21 October 1967, during the Arab-Israeli "Six Day War," three Soviet-designed SS-N-2 "Styx" missiles from two Egyptian-manned, Soviet-supplied Komar-class missile craft attacked and sank the Israeli destroyer INS EILAT (K40) off Port Said, Egypt. EILAT was the ex-HMS ZEALOUS (R39), a former British World War II destroyer of the "Z" class. The sinking of the EILAT caused a major panic among the world's navies and kicked point-defense systems into high gear. Until the EILAT's sinking, fleet air defense had concerned itself with the destruction of attacking manned aircraft. Defeating a small, fast, low-flying threat represented by an unmanned cruise missile was a completely different story and warships were not defended against this threat. Worse, these anti-ship missile (ASM) systems could be fielded and operated by small countries. The attacked - INS EILAT (K40) [ex-HMS ZEALOUS (R39)] as she was at the time of the Arab-Israel Six Day War. Photograph: Israeli Navy. 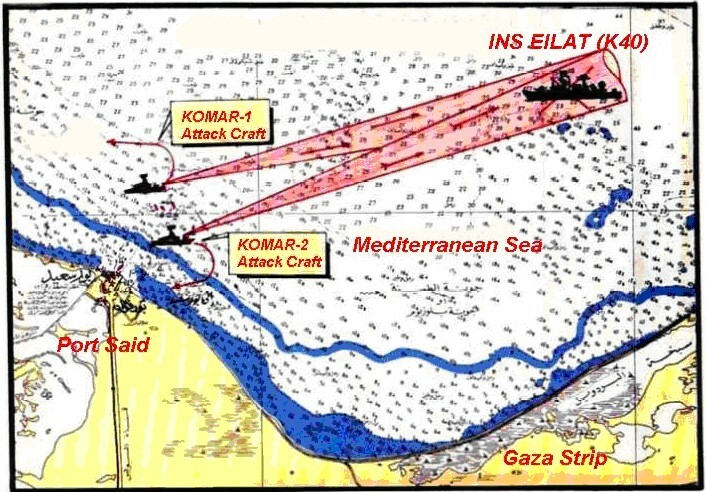 The attackers - two Komar missile attack craft of the United Arab Republic (Egyptian) Navy. Photograph: UAR Navy. The attack on EILAT of 21 October 1967 - from the Egyptian newspaper "Al Gomhoreya" - with English captions from the Arabic. Art: "Al Gomhoreya" via Bob Stoner. The Navy approached ASM defense as both a surface-to-air (SAM) missile problem and as a gun problem. The first SAM system specifically designed to deal with the ASM problem was the Basic Point Defense Missile System or BPDMS. The BPDMS was first tested aboard USS BRADLEY (FF-1041) in February 1967. The BPDMS used eight modified RIM-7E Sea Sparrow missiles in an eight-cell Mk 25 launcher that was a scaled-down version of the Mk 112 launcher for the ASROC (Anti-Submarine Rocket). The Mk 115 fire control radar system provided targeting for the RIM-7E. Missile range was about 10 to 16 miles with a 65-pound high explosive, continuous rod warhead. The Basic Point Defense Missile System (BPDMS) was composed of the Mk 115 fire control director and Mk 25 launcher. The Mk 115 director was a manned system as shown in this photo taken aboard USS DWIGHT D. EISENHOWER (CVN-69). Photograph: U.S. Navy. 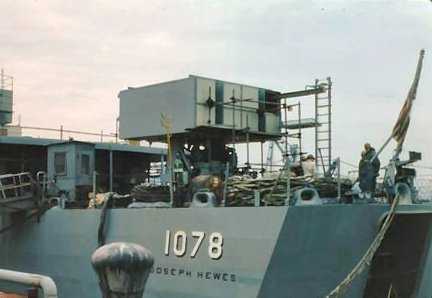 The Mk 25 launcher for Sea Sparrow aboard the Knox-class frigate USS JOSEPH HEWES (FF-1078.) Photo: Tom Oshgan. Meanwhile, General Dynamics Corporation, Pomona Division, started with the Army's self-propelled M163 Vulcan Air Defense System (VADS) to produce an automated version for naval service. This new weapon was called Vulcan-Phalanx (later shortened to just Phalanx). 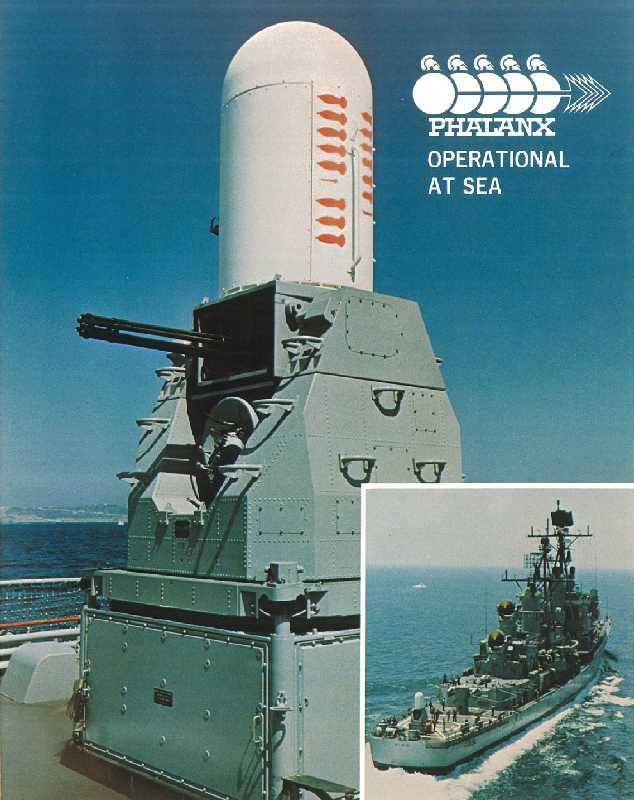 The prototype Phalanx was installed aboard USS KING (DLG-10/DDG-41) in 1973 for evaluation. Another prototype CIWS was used in tests conducted aboard ex-USS ALFRED A. CUNNINGHAM (DD-752). Several different kinds of missiles were fired at CUNNINGHAM; all were shot down. Full operational and evaluation trials were performed aboard USS BIGELOW (DD-942) in 1977. The evaluations included tests with high levels of jamming noise during which the unit succeeded in distinguishing small missile-like targets against nearby islands.Phalanx met and exceeded all maintenance and reliability requirements. The first production units of Phalanx were installed aboard USS CORAL SEA (CV-43) in 1980. Installation aboard noncombatant ships began in 1984. Block 1 was deployed aboard USS WISCONSIN (BB-64) in 1988. Block 1B was deployed aboard USS UNDERWOOD (FFG-38) in 1999 and was operational aboard USS TAYLOR (FFG-50) in 2000. 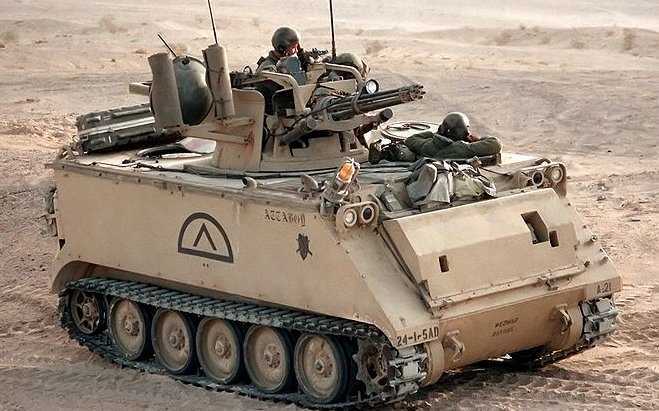 The M163 Vulcan Air Defense System (VADS) as installed on the M113 armored personnel carrier. This M163 VADS of the 24th Infantry Division is shown at the Fort Irwin National Training Center on 1 November 1988. Photograph: U.S. Army. The very first Phalanx prototype aboard USS KING (DLG-10/DDG-41). The gun was located on the fantail of the ship as shown in the insert. Kill markings are stenciled on the radome for the search and fire control radars. Photograph: Mark Donovan, USS King Association. A production Phalanx Block 1A firing. Note the enlarged ammunition drum and different gun support yokes that support the gun and radome. Photograph: U.S. Navy. The Falklands War between the UK and Argentina in 1982 raised further questions about the effectiveness of ASM defense. In that war, several British ships were struck by French-built Exocet ASMs. To find out how well Phalanx would handle this kind of threats, the latest version of the Mk 15 Mod 0 Phalanx, called the Block 0, was installed aboard the test ship ex-USS STODDARD (DD-566) in November 1983. A year long round of real world tests against all kinds of targets - including live warheads - were undertaken. Lessons learned from these tests were incorporated into the Block 1 version of Phalanx. Further tests from June 1985 through early 1990 against Block 1 Phalanx were conducted aboard STODDARD that led to Block 1, Baseline 1 and 2 improvements. These tests led to the development of the Block 1A variant that introduced an updated computer with software designed to engage targets doing high-G and diving maneuvers. The timeline of Phalanx development beginning with the Mk 15 Mod 0 Block 0. Artwork: Raytheon. The Phalanx uses the M61-series Vulcan Gatling gun rotary cannon firing the 20x102mm round. The M61-series gun has six barrels; Block 0 and 1A barrels are 76 calibers (1,520mm or 60 inches) long and Block 1B barrels are 99 calibers (1,980mm or 78 inches) long. The ammunition has electric primers and is carried in a drum below the gun. The drum uses a helical screw to feed ammunition to the gun. The drum has a capacity of 990 or 1,550 rounds. Live ammunition is carried to the gun by a linkless feed system; fired cases are returned from the gun for storage in the drum by the same linkless feed system. No ammunition links are used while the gun is in operation to assure a smooth feed cycle. On Block 0 reloading of the drum can take between 10 to 30 minutes if loaded from prelinked ammunition boxes. Block 1 and later guns use a preloaded ammunition loader/unloader cart. The loader/unloader cart uses linked live ammuntion and a drum loader adapter. The linked ammunition is connected to the adapter (yellow part in the photographs) that attaches to the end of the drum. The adapter turns the screw feeder of the drum to bring fired cases to the mouth of the drum. Live rounds that enter the adapter have their links stripped off. A feed chute moves the delinked live ammuntion to the bottom of the drum where it enters to begin the reloading cycle. The stripped links are recycled. The adapter relinks them to the fired cases as they come out of the end of the drum. The relinked empty cases are stowed aboard the cart or ammunition boxes. 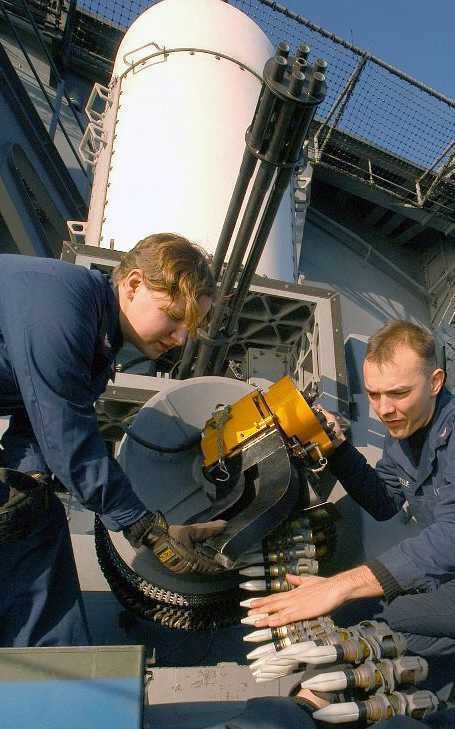 Loading Mk 149 Mod 4 ammunition into the Phalanx drum on USS GEORGE WASHINGTON (CVN-73) in January 2004. The live ammunition is going in and the fired cases are coming out - both linked. The join-line of the sabot can be clearly seen in this picture. US Navy Photograph No. 040122-N-3986D-002. 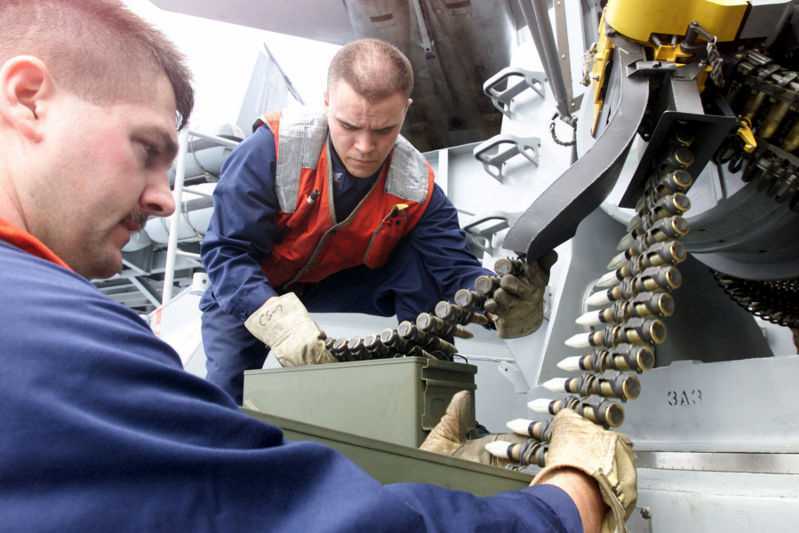 A closer look at loading Mk 149 Mod 4 ammunition into the Phalanx feeder drum. The yellow part is the delinker/linker adapter for the drum. Photograph: PH1 Tina M. Ackerman. A sectioned view of the Mk 149 Mod 4 cartridge. Artwork: General Dynamics Corp. The 20x102mm ammunition for the Mk 15 Mod 0 uses a heavy metal penetrator to knock down aerial targets. Mk 149 or Mk 244 projectiles have no explosive filler. The Mk 149 Mod 0 and Mod 2 projectiles use a depleted uranium sub-caliber penetrator. The Mk 149 Mod 4 and Mk 244 Mod 0 rounds use a tungsten or tungsten alloy steel penetrator. Mk 149 Mod 4 rounds use a red tracer element. Range of the Mk 149 Mod 4 projectile @ 45 degrees is 6,000 yards (5,500 meters); maximum effective range is 1,625 yards (1,490 meters). Because the 20mm projectile of Phalanx contains no explosive filler, the kill mechanism for this round is either warhead detonation of the target (a hard kill) or aerodynamic disintegration of the missile airframe caused by the high-speed slipstream over the damaged areas (a soft kill). The Mk 244 Mod 0 cartridge is known as the ELC (Enhanced Leathality Cartridge). It has a more aerodynamic tungsten alloy penetrator that gives an increase in effective range. Muzzle velocity is 3,650 feet per second (1,113 meters per second) for the Mk 149 cartridge. The M61-series gun uses the 20x102mm cartridge (left). It is shown compared to the 20x110mm cartridge used by the M3, M24, Mk 12 and Mk 16 20mm machine guns of the USAF and USN. Photograph: Anthony G. Williams. hydraulics, pneumatics, train power drive, power supply, and cooling water pump. Artwork: General Dynamics Corp. via Bob Stoner. The Mk 15 Mod 0 Phalanx is broken down into the M61A1 20mm rotary cannon and the Mk 72 mount. The Mk 72 mount contains the hydraulics, pneumatics, computers, power drives, power supplies, and coolant water pumps. A Mk 15 Mod 0 Block 1 or 1A gun on the left compared to a Block 1B gun on the right. The major recognition features are longer gun barrels, barrel clamp, barrel brace, and electro-optical equipment on the side of the radome instantly identifies the Block 1B variant. Photographs: US Navy. The Mk 15 Mod 0 is the base model of Phalanx. 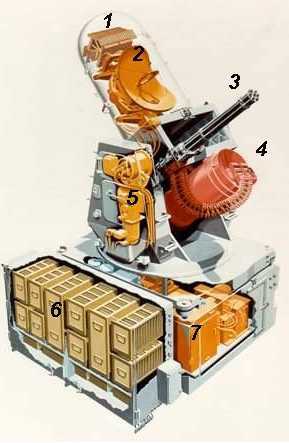 Blocks 0 and 1 have a hydraulic drive for the M61A1 gun that produces a cyclic rate of 3,000 rounds per minute. Block 0 guns have a 990 round magazine. Block 1 guns have a 1,550 round magazine. Block 1A and 1B have 1,550 round magazines and a pneumatic gun drive that produces a 4,500 rounds per minute cyclic rate. Block 1B guns use an electro-optical sighting system and have anti-air and anti-surface capabilities lacking in Block 0 through 1A. Train is unlimited, but software and mechanical stops prevent firing into the ship's structure. Elevation of the gun has increased during the various Blocks; Block 0 is -10 to +80 degrees, Block 1 is -20 to +80 degrees, Block 1B is -25 to +85 degrees. All Phalanx systems in U.S. service are being brought to Block 1B standard. Block 1B systems can be linked with the RIM-116 Rolling Airframe Missile (RAM) or SeaRAM systems. These systems use modifications of the Mk 72 mount for the M61A1 gun. 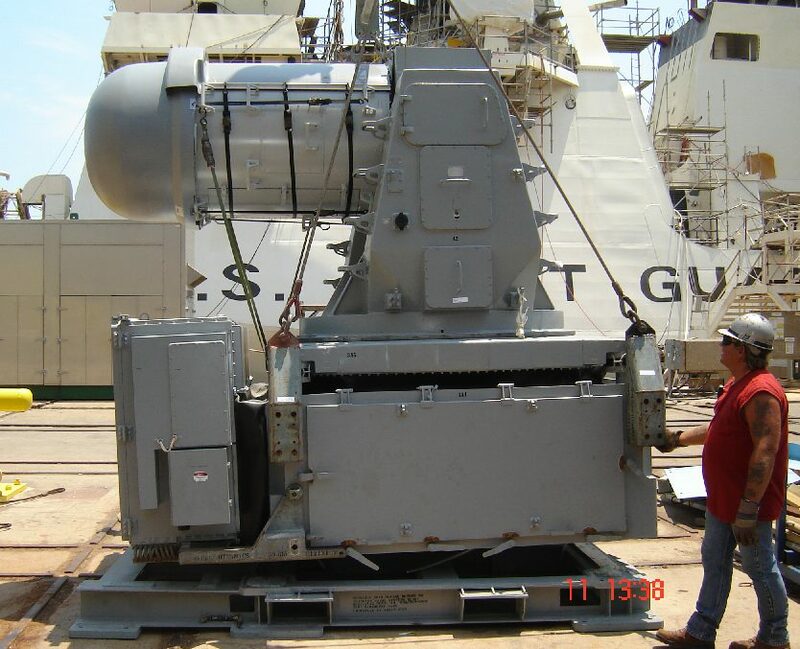 A Mk 15 Mod 0 Block 1B CIWS being hoisted aboard the new USCG cutter Berthof (WSML-750) in Pascagoula, Mississippi, on 13 November 2008. 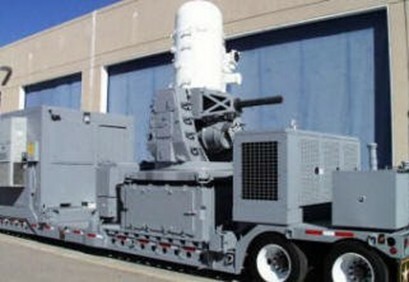 The self-contained nature of the Phalanx CIWS is demonstrated in this photograph. Photograph: USCG. CIWS is designed to be a bolt-on system. The Mk 72 mount only requires a working circle of 18 feet (5.5 metres) of clear deck, 440 VAC, 3-phase, 60 Hz, and 115 VAC, 60 Hz electrical power, a ship's heading input, and a saltwater coolant line delivering 20 gallons per minute at 30 psig (30 litres per minute at 2 kilograms per square centimetre). The Mk 340 weapons control panel is located in the ship's Combat Information Center (CIC), but there is a Mk 339 local control panel located close to the gun for system operational checks. Phalanx is designed to be a stand alone system, but it can accept inputs from the Aegis Combat System on major warships. CIWS has two radar antennas. The upper antenna is the search radar that rotates at 90 revolutions per minute. This is a Ku band digital moving track indicator radar. The lower, orange peel-shaped antenna is the fire control radar or tracking antenna. This radar is a Ku band digital pulse doppler mono-pulse radar. 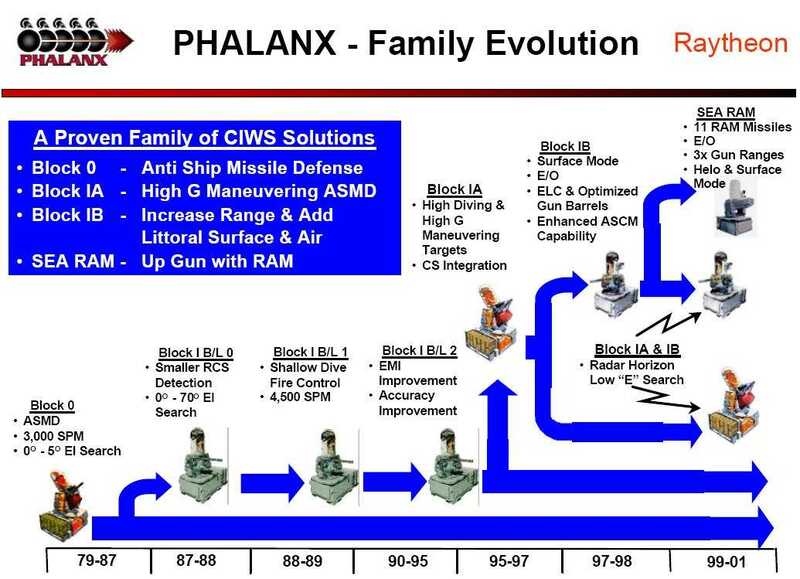 Phalanx uses closed loop spotting and target prioritizing. The search radar identifies the target at 10 nautical miles and the software begins tracking. At the same time, the software compares the target track against its threat logic. The threat logic determines the pirority assigned to the target. Phalanx does not recognize an IFF (Identification Frend or Foe) signal from an on-board transponder on friendly aircraft. Instead, the target threat software makes the decision to engage or not and the priority of engagement. Target assignment and priority are done at 5 miles and engagement begins at or about 2 miles. Once the software determines that the threat is in range, the gun opens fire. The tracking (fire control) radar monitors the outbound projectile stream. Closed loop spotting is used; that is, the outbound projectile stream is compared to the inbound target track and the gun drives are adjusted to move the projectile stream onto the target. Usually, the third projectile out the barrel is on target. Phalanx considers the target "killed" when it disappears from the radar (blows up or crashes into the sea - a "hard kill") or if there is an abrupt change in target speed and direction that accompanies a breakup of the target's airframe (a "soft kill"). Once a hard or soft kill on the target is made, Phalanx will engage the next threat. Up to six threats can be processed at a time. Is the range of the target increasing or decreasing relative to the ship? CIWS discards outbound targets. Only inbound targets are considered. Can the contact maneuver to hit the ship? CIWS considers target heading in relation to the ship and its speed when determining whether it can hit the ship. Does the target speed fall within engagement minimum and maximum speeds? CIWS will not engage targets outside these minmum and maximum limits. However, the CIWS operator can adjust the limits manually. Phalanx is turned ON and in AUTO mode, with its magazine loaded and ammunition fed to the gun. Search radar acquires inbound threat at 10 miles; Phalanx software starts track, assigns priority. Search radar continues track; software confirms threat; fire control radar locks onto target at 5 miles. About 2 miles (or at optimal range assigned by software) gun opens fire on Threat 1 and continues until a hard or soft kill is achieved. Phalanx switches to engage Threat 2 or ceases fire. Phalanx continues to search for threats. Phalanx drum is reloaded at first opportunity. Chinese "Silkworm" missiles being loaded aboard a fast attack craft (FAC) of the People's Liberation Army-Navy (PLAN). The missile is a copy of the Soviet SS-N-2 Styx. The wings unfold when the missile leaves its launch tube. The SS-N-2 is powered by an air-breathing turbojet engine and is boosted to flight speed by a disposable solid rocket booster. Photographs: Chinese PLAN. On 17 March 1987, Iraqi F1 fighter-bombers armed with French-built AM39 "Exocet" missiles attacked USS STARK (FFG-31). 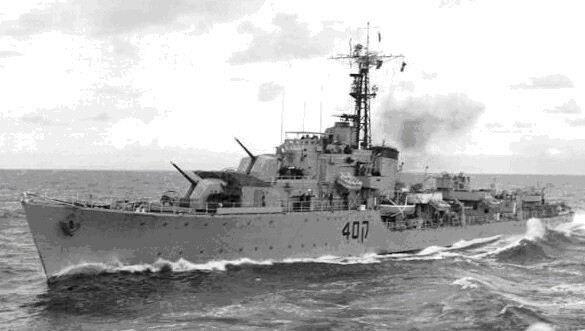 Two AM39 missiles hit forward of the bridge portside; one did not explode and spewed burning propellant inside the ship while the other penetrated the crew quarters. Thirty-seven American sailors were killed and 21 were wounded. The Mk 15 Phalanx was in STANDBY mode and did not engage. Mk 36 Super Rapid Bloom Off-board Chaff (SRBOC) countermeasures were not armed. The SM-1 Standard missile could not engage because the Iraqi F1 was in the blind spot of the ship's STIR (Separate Target Illumination Radar). Phalanx failed because it was not turned ON. During the first Gulf War, USS JARRETT (FFG-33) was operating several miles from USS MISSOURI (BB-63) and the British destroyer HMS GLOUCESTER (D96) on 25 February 1991. On that day, the ships were attacked by an Iraqi Silkworm missile (a Chinese copy of the Soviet SS-N-2 Styx). MISSOURI fired its Mk 36 SRBOC decoys. JARRETT's Phalanx was operating in automatic target acquisition mode and malfunctioned, targeted MISSOURI's chaff cloud, and fired a burst. Four rounds hit MISSOURI which was about 3 miles (5 km) away from JARRETT. There were no injuries. GLOUCESTER fired a Sea Dart missile that destroyed the Iraqi Silkworm. This incident was the first time that a shipboard missile had killed a cruise missile under combat conditions at sea. On 4 June 1996, the Asagira-class destroyer YUGIRI of the Japanese Maritime Self Defense Force (JMSDF) accidentally shot down a U.S. Navy A-6 Intruder jet that was towing a radar reflective target during joint gunnery exercises. Both pilot and bombardier-navigator ejected successfully. The YUGIRI's radar locked onto the Intruder instead of the sleeve. A post-accident review board concluded that YUGIRI's Phalanx was in manual control and the YUGIRI's gunnery officer gave the order to fire before the A-6 was out of the CIWS engagement envelope. These three incidents are instructive in several respects. First, CIWS does not work if it is OFF or in STANDBY mode. USS STARK found this out with fatal results. Second, systems do malfunction in combat situations and it is imperative to have backups in place. In this case, Sea Dart killed the inbound missile. Third, human errors can lead to friendly fire incidents. When I was on USS HALSEY POWELL (DD-686) during an anti-air warfare shoot in 1967, our Mk 37 director locked onto the the target sleeve's tow cable and began following it towards the target tug S-2E Tracker (Mk 37 director operators were warned about this characteristic of the Mk 25 radar, but it happened anyway). The first indication was a direct hit about half way between the target tug and the gunnery sleeve. The 5-inch projectile explosion severed the cable. The tow plane immediately signaled: "Cease fire. Exercise over." The target tug returned to base with a rather shaken aircrew. Raytheon C-RAM (aka "Centurion") on its trailer. Photograph: Raytheon Company. The U.S. Army's version of CIWS is called C-RAM (Counter-Rocket, Artillery, and Missile) system or the "Centurion". First C-RAM units were deployed to Iraq in the summer of 2005. C-RAM protects forward operating bases and other high-value sites in and about Baghdad. C-RAM also deployed with British units around Basrah in the southern part of Iraq. Like CIWS, C-RAM uses the M61A1 20mm Gatling gun firing between 3,000 to 4,500 rounds per minute. By 2008, there were over 30 C-RAM systems protecting bases in the U.S. Central Command Area of Operations. A Raytheon spokesman told Navy Times that 105 attacks had been defeated by the C-RAM system. Another 23 C-RAM systems were on order for Army use in September 2008. 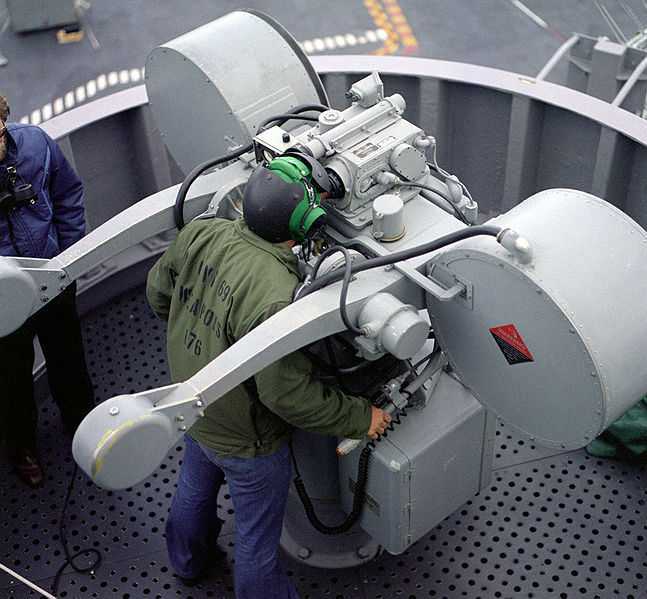 C-RAM does not use the Mk 149 or Mk 244 rounds of the Navy's CIWS. Instead, C-RAM uses either the M246 HEIT-SD (high explosive incendiary tracer, self-destroying) or M940 MPT-SD (multi-purpose tracer, self-destroying) ammunition. The self-destroying feature on tracer burn-out prevents live ammunition from coming down on friendly areas and personnel. 3.000 to 4,500 rounds per minute. Ku band search and fire control (tracking).